Increasing case loads and budget and staffing cuts in forensic laboratories continue to motivate the development of higher throughput methods, particularly for confirmatory analysis of regulated intoxicants. 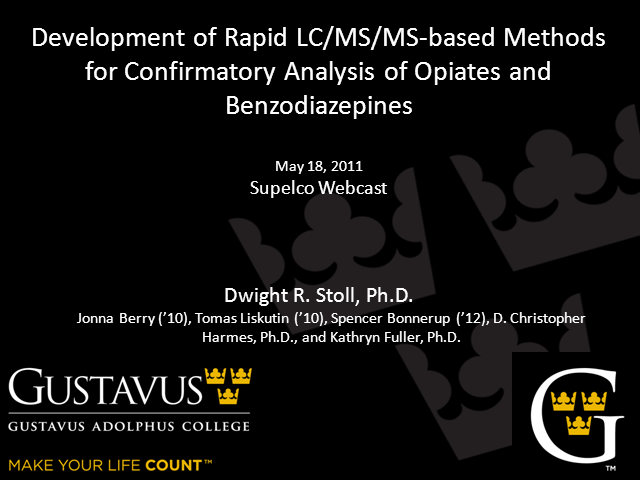 In this work, we have focused on the development of rapid LC/MS/MS methods for the determination of nine opiates including two glucuronide metabolites, and 16 benzodiazepines, including two amino- metabolites. Here we aim to analyze both the parent compounds and important polar metabolites in a single analysis. To this end we have compared the retention of the target compounds on two different reversed-phase HPLC stationary phases: a conventional C18 type phase, and a perfluorinated phenyl (PFP or F5) phase built upon the increasingly popular Fused-Core particle morphology. We see that the F5 phase not only generally exhibits higher retention than the C18 type phase, but also exhibits very different selectivity such that the nine opiates can be nearly completely resolved in under four minutes. We find that the mixture of 16 benzodiazepines cannot be completely resolved in a reasonable (i.e., less than 20 min.) time, however we have developed a separation with no more than three overlapping peaks in an analysis time of five minutes.